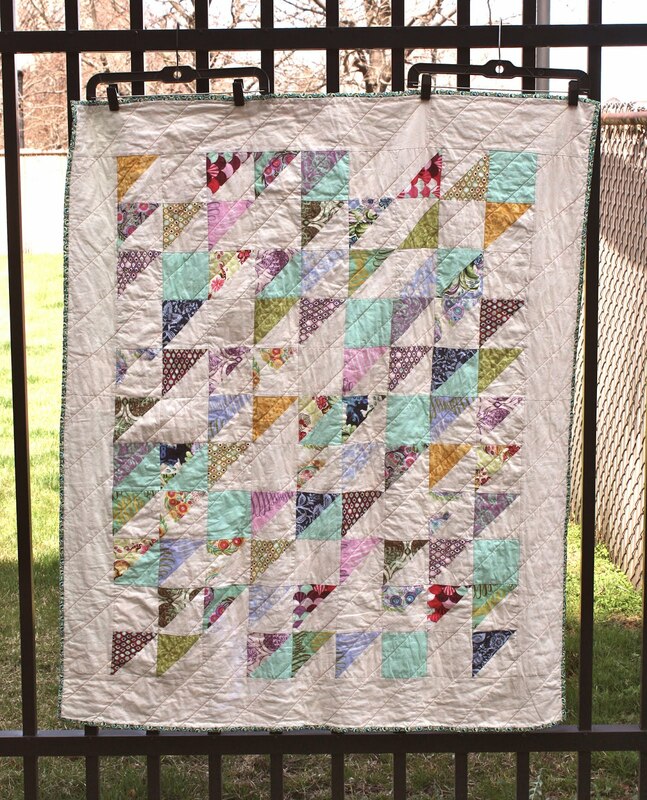 52 Quilters: Week 13: Gotham Quilts! Hello everybody! 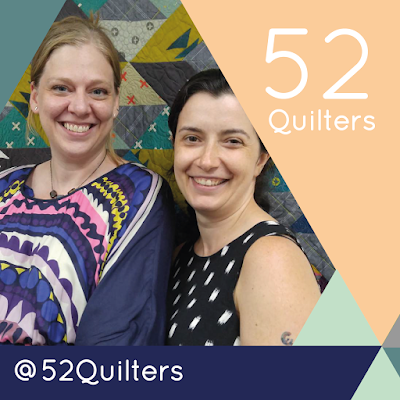 I'm Ivete of Gotham Quilts (on the right in this photo, with my business partner Andrea) and I'm so excited to be taking over this week! Andrea and I are the "fabric nerds" who own Gotham Quilts, a shop in NYC and online which we started in August of 2014. We're modern quilters who love color, low volume, negative space, and anything Tula Pink does (ok that last one is mostly just me, I'm a serious Tula nut!). Andrea and I met years ago when I signed up for a learn-to-quilt class and she was the teacher. I fell so hard for quilting that I finished 3 quilts during the 6-week class! We've been friends ever since, and at some point we started talking about what kind of quilt shop we really wanted and we felt like NYC very much needed. 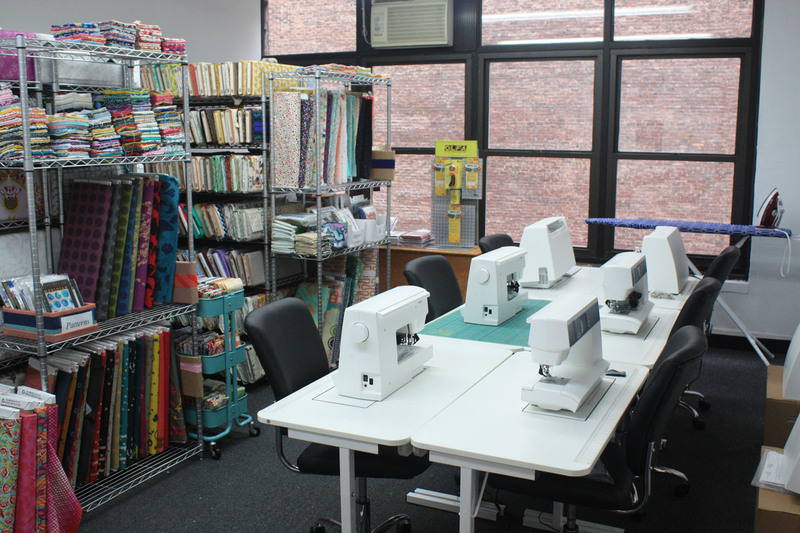 After lots of planning and research, we started Gotham Quilts in 2014 and we opened our virtual doors in August of 2014 at gothamquilts.com. This week I'll be posting about our quilts (include our free quilt patterns! ), a little about NYC, and I'll also be covering the Brooklyn Quilters Guild Quilt Show which is happening next weekend. We'll be there vending in our booth and also walking the show floor to see and take pictures of all the wonderful quilts our fellow New Yorkers have made! This quilt is the first quilt I ever finished, and of course I made it in that first class with Andrea. And of course it's full of Tula Pink fabrics as well! I had just learned what a half-square triangle (HST) is, and that you don't have to make a quilt perfectly symmetrical or "even" all the time. I picked two coordinating solids that worked with the Tula Pink Parisville charm pack I had, made a who stack of HST's, and then played around with the layout until I had something I was happy with. I quilted it with simple diagonal lines and even though it's a bit on the small size, I still have this quilt on my couch and use it all the time. Isn't that Kaffee Fassett print perfect as a coordinate for the front?! 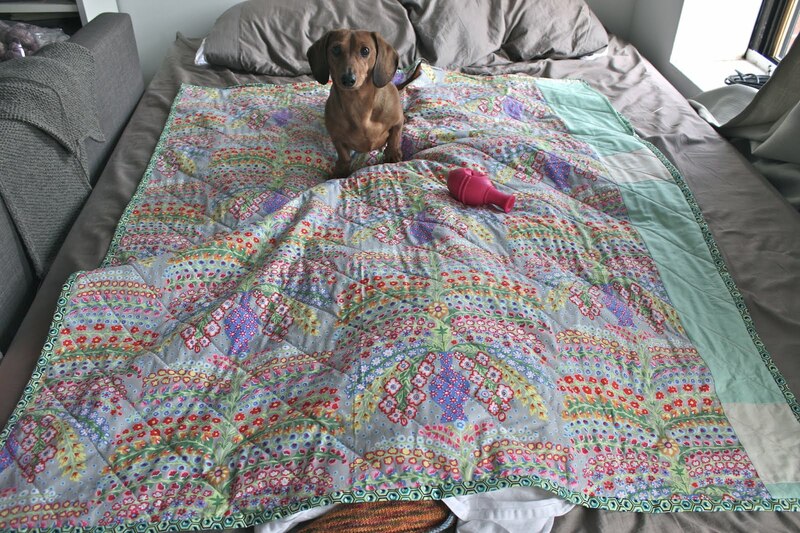 Oh and that's my dachshund Arnold posing on the quilt back... he loves quilts as much as I do! I sometimes get asked "why do you quilt?" (actually, I'm more frequently asked to explain what I even mean by "quilting"!) and I have a hard time giving a short, sweet answer. I end up rambling about how much I love fabric (the colors! the adorable prints! the thrill of finding a coordinating print that works perfectly with the fabric I already have! ), how much I love the quilting step (the texture! the challenge! the thrill of adding a second layer of design to the pieced top! ), and how much I love this community (the quilt guilds! the blogs! the thrill of meeting others with whom you can gush about that perfect fabric match!). Is there anything you want me to talk about during this week? If so leave a comment and let me know! I have been to NYC once--would love to come visit again.Looking forward to your week here.